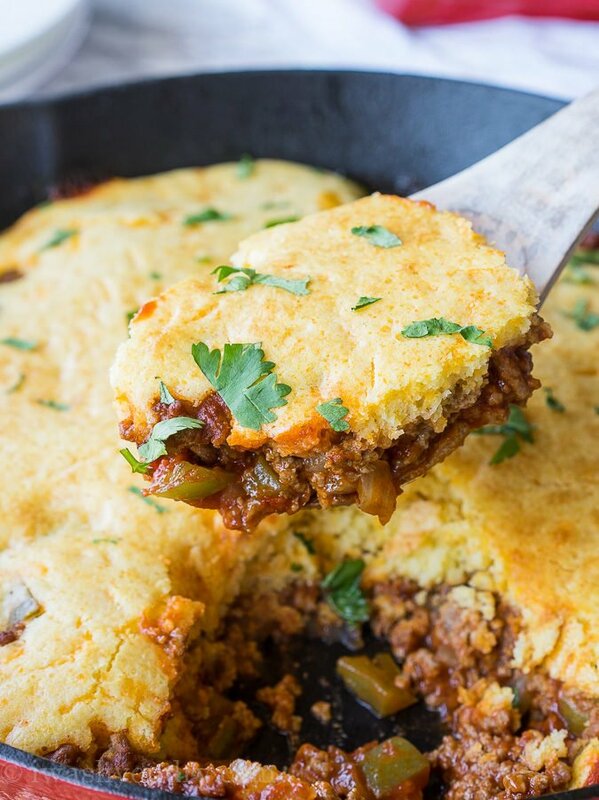 This One Skillet Sloppy Jo Cornbread Casserole was a hands-down, two thumbs up, no leftovers, WINNER! 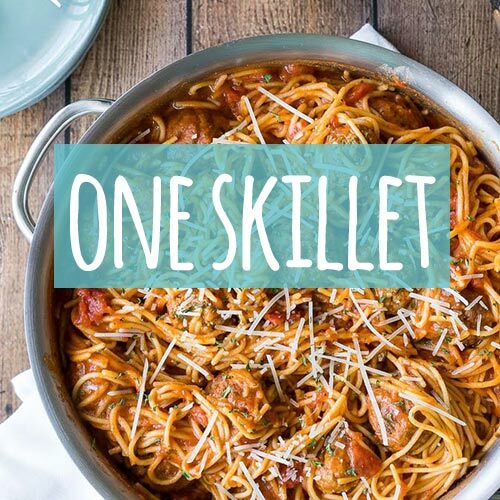 Are you ready for another amazing dinner recipe that’s cooked in just one pan? School is back in session so easy weeknight dinners that come together in less than 30 minutes are my absolute favorite. 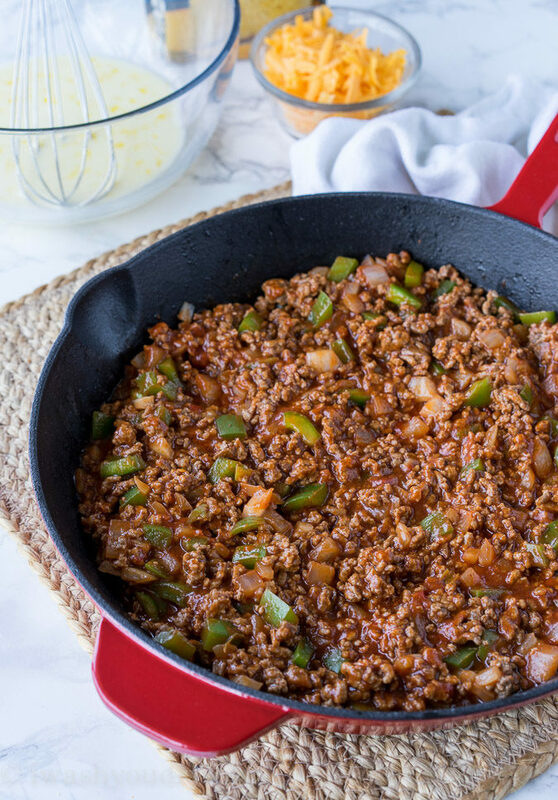 The first thing you’ll want to do is quickly brown some ground beef in a skillet with some onions and green bell peppers. I used a can of sloppy jo sauce that I had in my pantry to make this dish extra saucy, but I’ve got a great homemade sauce recipe below in case you’re wanting to make your own! I don’t mind using the canned stuff every once in a while though, it’s just so easy. 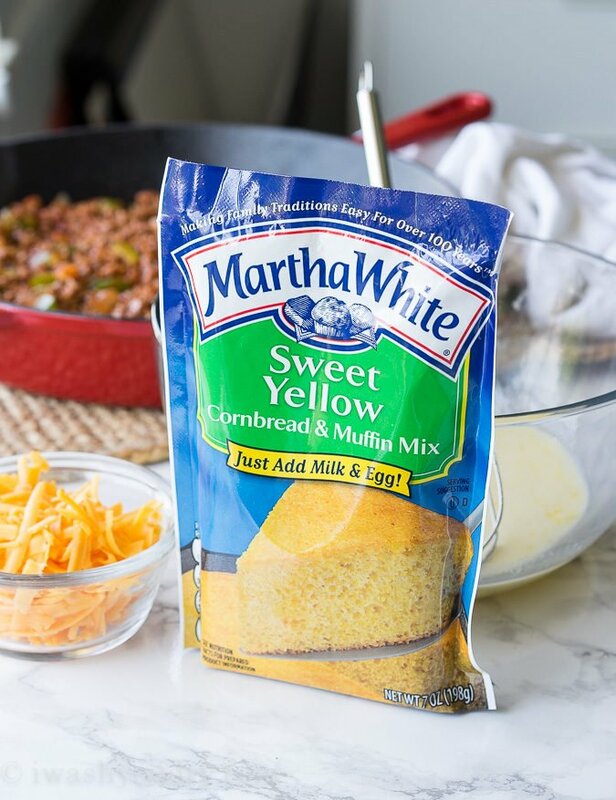 Once the sloppy jo mixture is ready, you can whip up some Martha White sweet yellow cornbread mix to top the beef. I’m excited to announce that I’ve partnered with Martha White for the next year to bring you guys more amazing, family friendly dishes like this one right here. 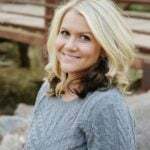 Martha White is once again partnering with the CMA’s for it’s 50th awards ceremony! Where are all my country music fans? Listen up!! Martha White is currently running a giveaway on their Facebook Page to give 4 lucky winners (and their guests) a trip to the 50th CMA Awards in Nashville, TN on November 2, 2016!! Gosh, I hope one of you guys win! If you do, you need to take lots of pictures and send them to me!! I jazzed up the cornbread mix by stirring in some shredded cheddar cheese. The I just poured it over the top of that gorgeous sloppy jo mixture and popped it in the oven to bake. You’ll want to make sure your skillet is oven safe before you start. 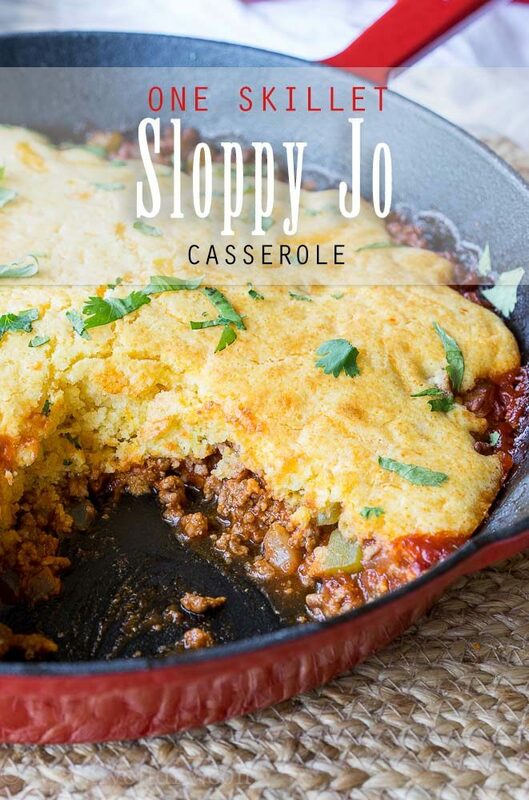 If you don’t have one, you can just transfer the sloppy jo mixture into a casserole dish and top with the cornbread mix before baking. It’s two dishes, but still worth it. 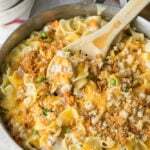 I’m telling you – my whole family DEVOURED this dish! 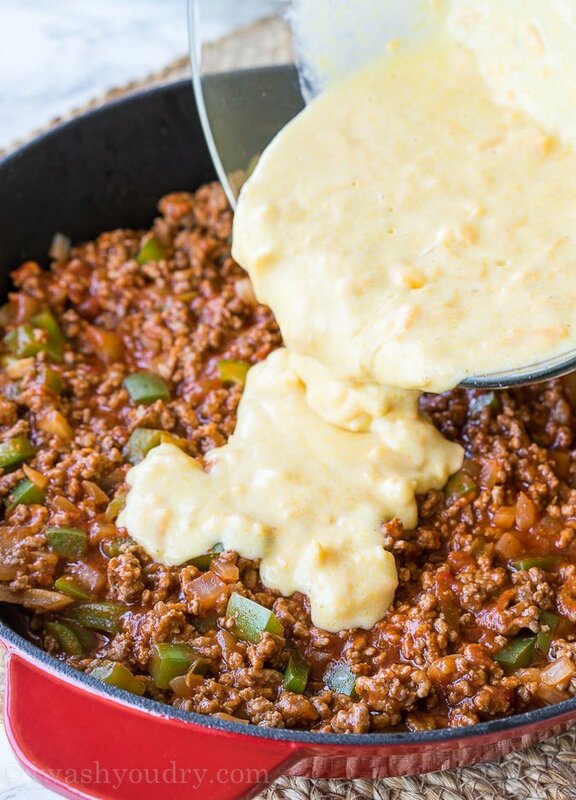 The sweet and savory sloppy jo with the perfectly tender cornbread topping and cheese… oh my gosh, I want another scoop right now. Don’t miss this promotion – ENTER HERE! Oh and here are the all the official rules in case you were wanting to read them too. 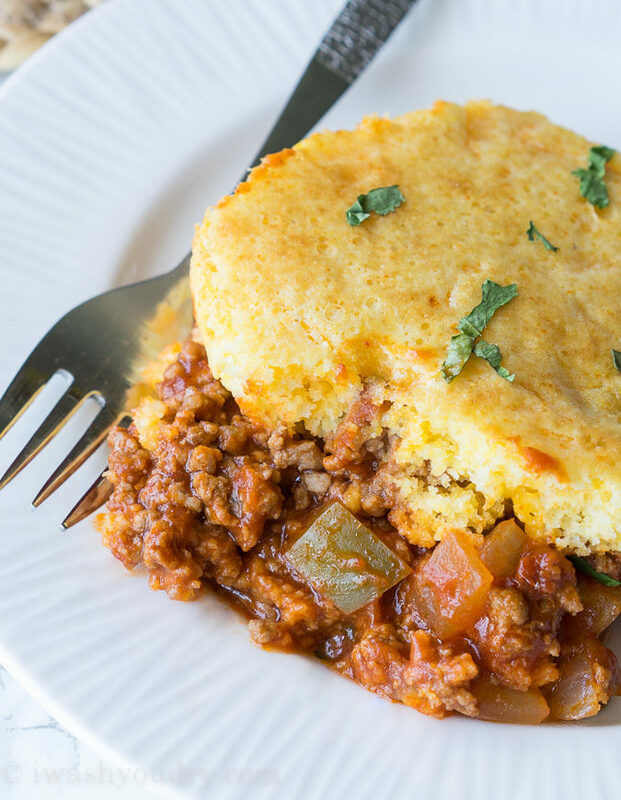 This sweet and savory One Skillet Sloppy Jo Cornbread Casserole has a perfectly tender cornbread topping with cheese. Heat an oven safe skillet on the stove to over medium high heat. Cook the ground beef, onion and green bell pepper until the beef is cooked through. Drain the fat from the skillet and stir in the sloppy jo sauce*, simmer for 2 to 3 minutes then remove from heat. 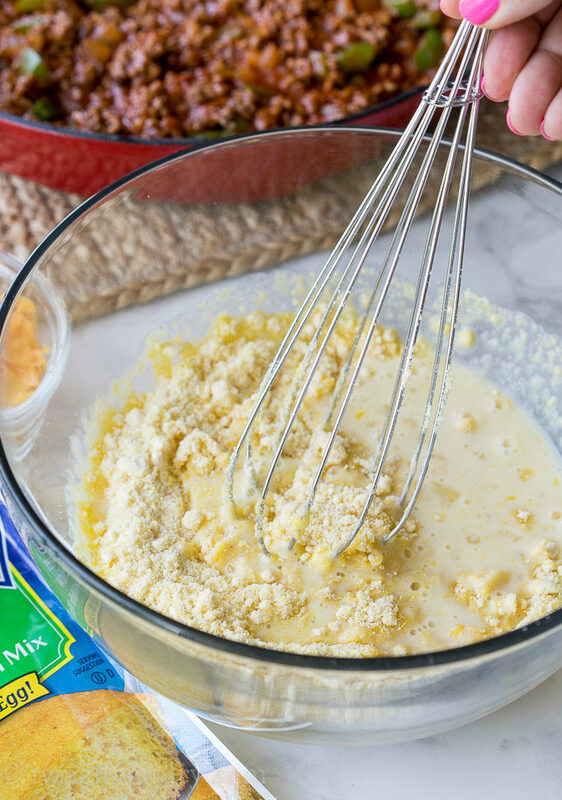 In a small bowl whisk together the Martha White Sweet Yellow Cornbread muffin mix with the milk and egg then stir in the cheese. Pour over the top of the sloppy jo mix. Bake for 15 to 20 minutes, or until cornbread is lightly browned on top and cooked through. Enjoy! Stir 3/4 cup ketchup, 3 tbsp brown sugar, 1 tsp prepared mustard, 1/2 tsp garlic powder and salt and pepper into the ground beef mixture and continue with recipe. Disclaimer: This post is in partnership with Martha White. All thoughts and opinions are 100% my own. Thank you for supporting the brands that help make I Wash You Dry possible. My grocery store does not carry Martha White cornbread, I bought Fleischmann brand instead, will this work?? As long as the product is similar in weight and added ingredients, any corn muffin mix should do. Made this last night and it was a hit and so easy! I love that we have leftovers as well. I couldn’t find that brand of corn muffin mix, but small boxed one I found worked perfectly. Thank you! I’m glad you were able to find one that worked. Thanks for letting me know. Made this tonight and it was amazing!! It is impossible to mess up. We even doubled the recipe but used only one can of manwich. Cornbread was perfect and we used the .79 brand in the blue box. Love this!! I have NEVER liked sloppy joes, but I eat them when I make them. 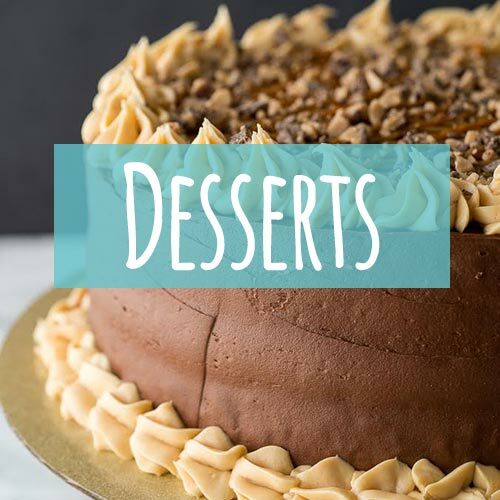 Until now…….I LOVE this recipe! It’s delicious and there are NEVER any leftovers!! Thank you!! Hands down horrible recipe. The corn bread mix just soaks into the mix. You don’t just simply “pour the corn bread mix over it” this is the second recipe I’ve made from Shawn and it’s also the second recipe that has turned out horrible. I will no longer be sharing these recipes and I will no longer be making any of them. For the second time I have wasted money on food and have had to throw away the food because it does not turn out the way the instructions say so. Horrible recipe. It almost sounds like she just poured the dry mix over the sloppy joe without adding the eggs and milk? I haven’t tried this recipe yet, but I plan too. 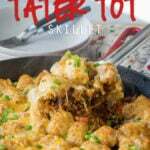 I’ve tried many of your recipes and I’m a huge fan! I made this today! Everyone loved it! 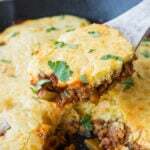 I make a similar recipe but I do browned & drained hamburger, can drained sweet corn, can of drained light red kidney beans, jar of salsa (mild to spicy your preference) and pkg of taco season mix together then pour cornbread mix (prepared as stated on pkg) over top and bake till cornbread browned. Would love to make this recipt,buthere in England we can notget ready madecornbread, what else could i use instead? It’s the cornbread mixture i need ??? Buy a package of cornmeal in baking aisle. It should have recipe for cornbread on the pkg. If not try mfg website or Quaker. Or other internet recipe sites. Recipes with some white flour make a softer, less gritty product. 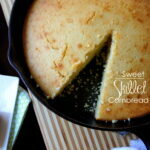 Make your own cornbread. Add a 1/2 lb of whole frozen corn kernels to the cornbread mix before spreading it on your sloppy joe. Try this recipe. Out with summer and in with comfort food. I’m loving this and know my kids would too!